The Japanese ships Ise, Inazuma and Makinami will sail with the USS Ronald Reagan, USS Nimitz and USS Theodore Roosevelt in the Sea of Japan and East China Sea. Tokyo: Japan said on Friday it would send one of its two big helicopter carriers, the largest warship in its fleet, along with two escorts to join three US aircraft carriers for exercises in waters close to the Korean peninsula. 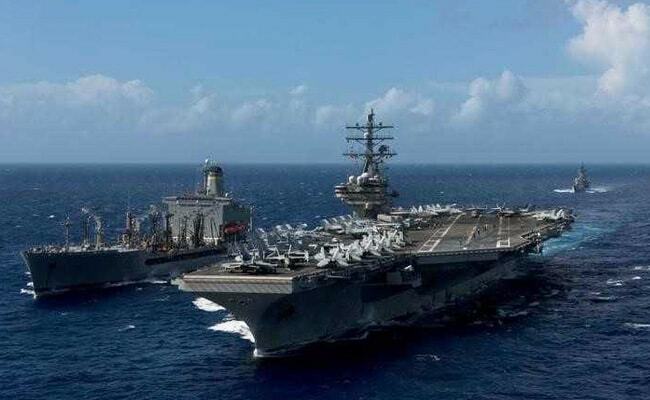 The Japanese ships Ise, Inazuma and Makinami will sail with the USS Ronald Reagan, USS Nimitz and USS Theodore Roosevelt in the Sea of Japan and East China Sea on Sunday, Japan's Maritime Self Defence Force said in a press release. It is the first time three American carriers have trained together in a decade. The show of force comes as US President Donald Trump meets with regional leaders at an Asia Pacific Economic Cooperation (APEC) in Vietnam. His administration has demanded that North Korea halt ballistic missile and nuclear tests. The naval exercise will be a potent reminder to Pyongyang of the US ability to rapidly mobilise military force.